Nepal has suffered a truly horrible earthquake. We were safely in Bangkok, editing our blogs and photographs when the disaster happened. That said, the 7.8 magnitude quake in Nepal is a major disaster for a country with very little wealth to support recovery. I personally encourage everyone who wants to become involved to start with a donation for relief. Yes, there are other ways become involved, and, simply, money can have a rapid and positive impact. Is there a call to action here beyond give? Yes. Get on your travel shoes and responsibly visit World Heritage Sites. Now. While they are still here. This week the Kathmandu Valley World Heritage Site is in a shambles. The condition of the Lumbini World Heritage Site, further from the epicenter, is less clear. We are hopeful. Saturday, April 20, 2015. The fate of these people is unknown. 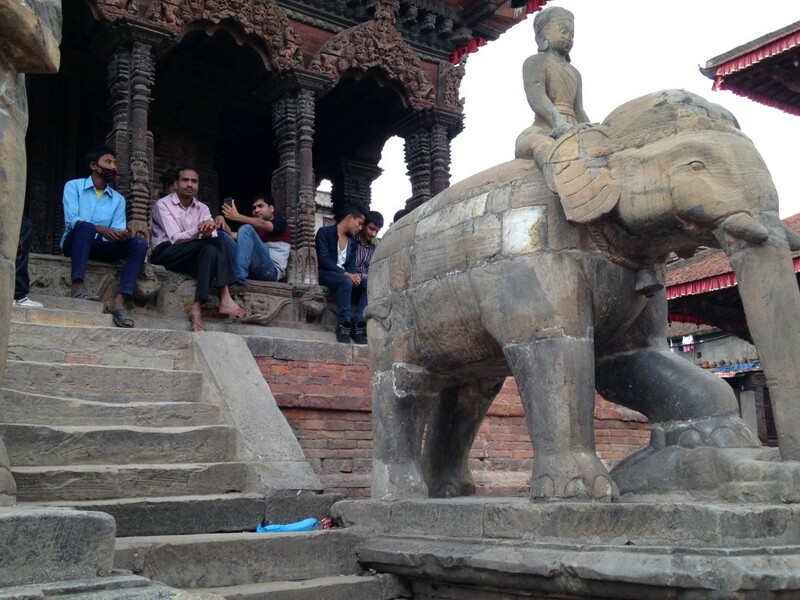 Early reports suggest that much of Patan Durbar Square, including this elephant and the temple on which the crowd is seated, has been flattened. Woe is Nepal. Click the image for more detail. Can they be rebuilt? Should they be rebuilt? 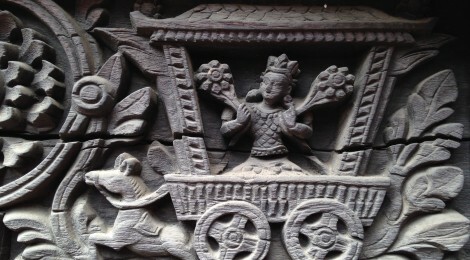 These two questions, and their philosophical kin are important, especially for the people of Nepal, whose economy is highly dependent on tourism. Instead of splitting hairs about the value of visiting a copy of the Taj Mahal, we’re recommending that you go visit the real Taj Mahal in Agra. Experience your heritage. You will find the experience enriching, unquestionably. And the people nearby your chosen site will be enriched, unquestionably.